I'm not really keen on goji berries, but like everything, I have come to like them, once rolled in chocolate I am quite fond of them. Discover one of the world's most nutrient-rich fruits, prized for its support for strength and longevity. Snack smart! Delight in the perfect balance of creamy chocolate or yogurt and the antioxidant power of goji berries. They're a highly nutritious snack more than a sweet treat. I'm a bit of a health nut, so I wasn't surprised when my Auntie bought me back a packet of these after finding them on sale in WholeFoods for £5.00. These little nuggets of energy are bursting with natural goodness like antioxidants (which help protect against free radicals) and fibre. It is often thought that something healthy lacks taste, but that simply isn't the case with these goji berry chocolates. 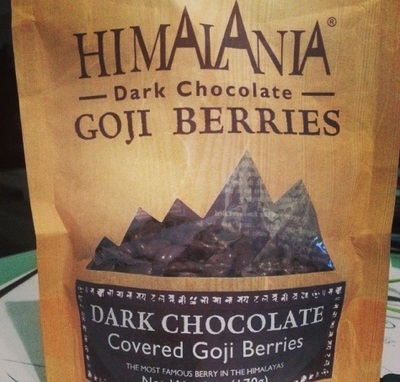 They taste exactly as I thought - goji berries coated in chocolate, but with a luxurious quality to them. They certainly fuel your body better than a snickers, and they don't taste too bad either.